El Nido is a little beach town nestled at the foot of the karst cliffs on the northwest side of Palawan. The town is a popular backpacker hangout with all the usual amenities typically found in such places, and is is a great base from where to explore some spectacular scenery, visit gorgeous beaches such as Nacpan beach, or go on one of the many El Nido boat tours, all activities which should be included on your El Nido itinerary. 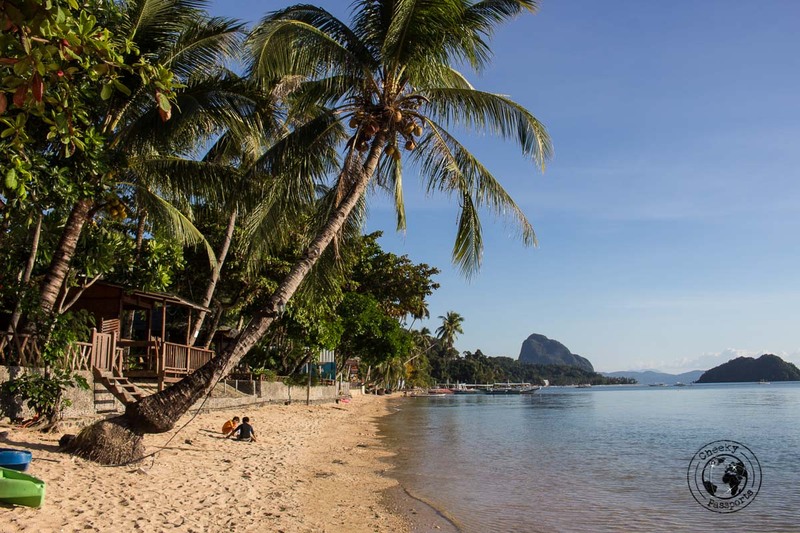 The town is a little less developed when compared to other similar backpacker towns in Southeast Asia, yet it is easy to find budget accommodation in El Nido, which can be used as base for planning out your El Nido itinerary. 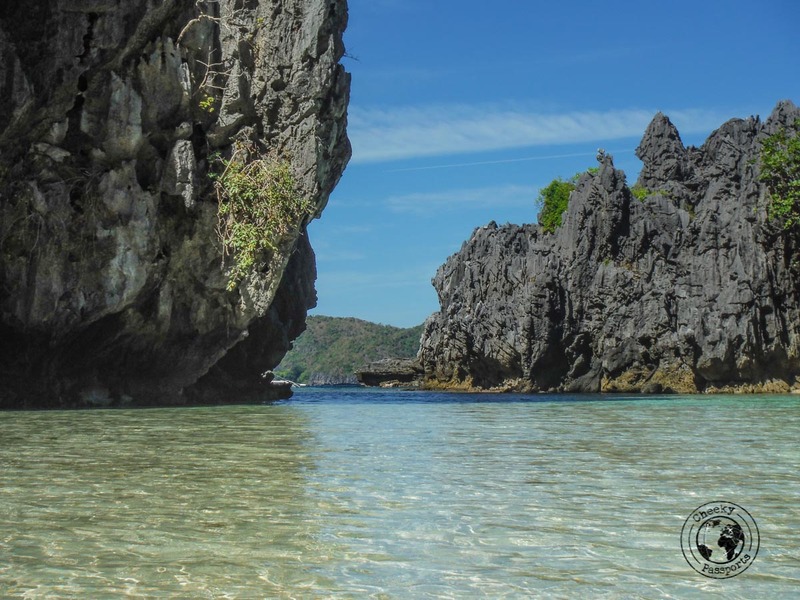 El Nido is also the gateway to exploring the beautiful Bacuit Archipelago, a collection of (mostly) uninhabited paradise islands with secluded beaches and fishing huts. 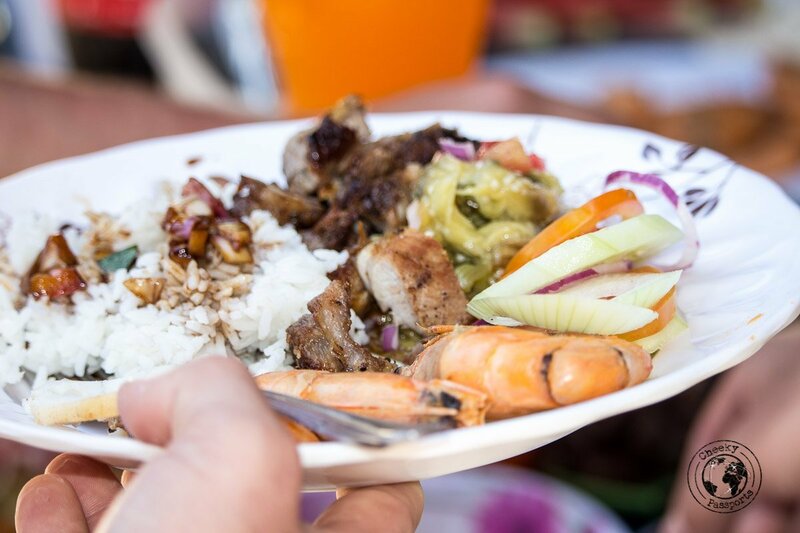 Although most budget accommodation in El Nido is located in El Nido town proper, this area is noisy, so we really recommend that you stay on the quieter outskirts of town, unless you are looking for some night life. 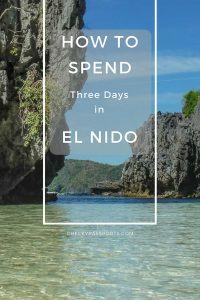 Our El Nido itinerary includes all the highlights which can be visited in three days. Check the latest accommodation prices on Hostelworld, Booking.com or Agoda. Having trouble booking internal flights in the Philippines? Try using Kiwi or Nusatrip! Book your Ferry tickets in the Philippines online with 12Go Asia. There are several ways of getting to El Nido depending on where you’re coming from. If you’re coming from Manila, you should get a flight from Manila to Puerto Princesa from where you can get a bus to El Nido, or a flight from Manila to Coron (Busuanga) from where you can get the Coron ferry to El Nido. Buses and vans depart from Puerto Princesa daily, making the process of getting to El Nido very easy. Prices start at around 380 PHP (€6) for the bus, and 500-700 PHP (€8-€11) for a van. If you’re in Sabang or Port Barton, the best way of getting to El Nido is by taking a van unless you feel like spending the day waiting for connecting buses at lonely junctions, which might anyway be full or never turn up at all. A van from Port Barton costs 500 PHP (€8 – this seems to be a very standard price for this route) and getting to El Nido takes about four hours with some breaks along the way. 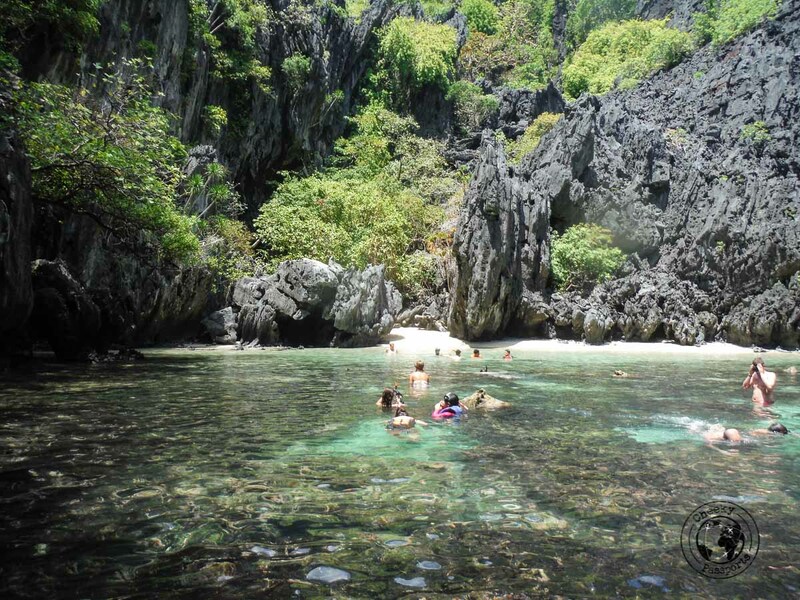 Getting to El Nido from Coron involves the use of a ferry which can be booked here. There is more than one Coron ferry plying the El Nido – Coron route. The slow ferry is the cheaper option (about 1400 PHP/ about €23), with a duration time of 5-9 hours. The faster Coron ferry, also called a fastcraft costs 1760 PHP (about €28) with a journey time of 3.5 hours. Although this is one of the options of getting to El Nido, we commuted in reverse via the fast Coron ferry and found the journey from El Nido to Coron to be very comfortable! Besides the Coron ferry, there’s also a cheaper passenger cargo ship which costs 1000 PHP (about €16) for a non-aircon seat and 1150 PHP (about €18.50) for an aircon seat, which leaves once a week with a journey time of 8 hours so we didn’t consider this option at all. On our first day in El Nido we headed into town to check out the vibe and walked back to our hostel (located on the outskirts of El Nido, in Corong-Corong, about 20 minutes walk away) along the beaches. The first section of the beach is full of shanties and rubbish, but it gets better as you walk further in and approach the resorts where garbage gives way to a vast expanse of cleaner sand. Coconut trees and bangkas line the beaches, whilst the horizon is dotted with karst islands. There is a beach in El Nido town proper which is where all the boat tours depart from. We were warned against swimming in it because the water there allegedly makes people sick. The best sunsets are not in El Nido but a few kilometers away at Las Cabanas (or Marimegmeg) beach. Any trike driver will take you there. The beaches in Corong-Corong (on the way to Las Cabanas) also offer some pretty spectacular sunsets and this was our favourite sunset spot since it was very close to where our hostel was located. 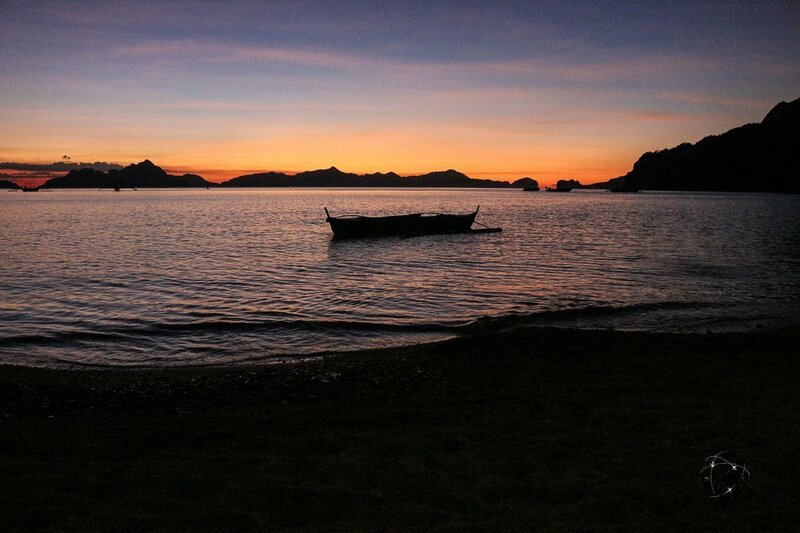 Be sure to include a sunset on your El Nido itinerary! If you get a beer from one of the bars along the beaches you can make use of their little plastic tables and chairs decked out specifically for sunset viewing. 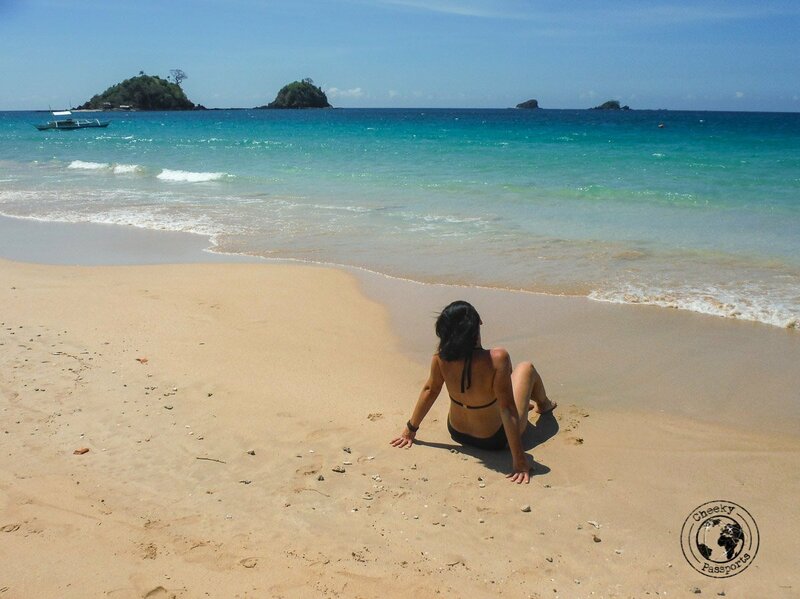 Our favourite spot in El Nido was without doubt Nacpan beach which is a 40 minutes’ trike ride away. 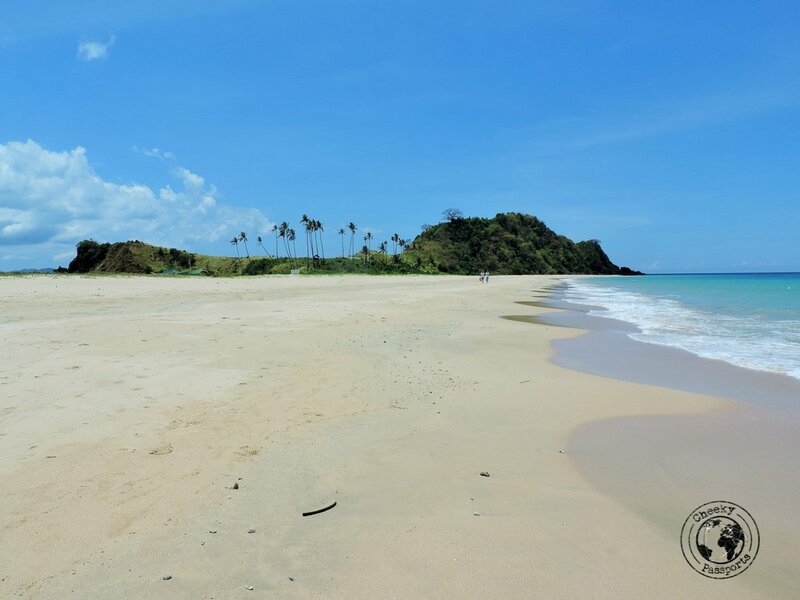 If you’re looking for a gorgeous but relatively empty and undeveloped beach, this is it and we thoroughly recommend that you include it on your El Nido itinerary! Nacpan beach makes up one half of El Nido’s twin beaches, the other half being Caitang beach which is not as beautiful. We got to Nacpan Beach on a trike, which after some negotiation cost us 1000 PHP (about €16), return included. We suspect that we could have reduced the price further but we were in too much of a hurry to get to Nacpan beach to bother trying! There’s a viewpoint on the west side of Nacpan beach which we tried to climb to, but quickly found out that it was inaccessible (at the time of writing) with No Entry signs posted all over. The heavily armed guards may have also been a clear warning sign! Quite a bugger since this spot provides the best view of the twin beaches, but there are some risks that are simply not worth taking! 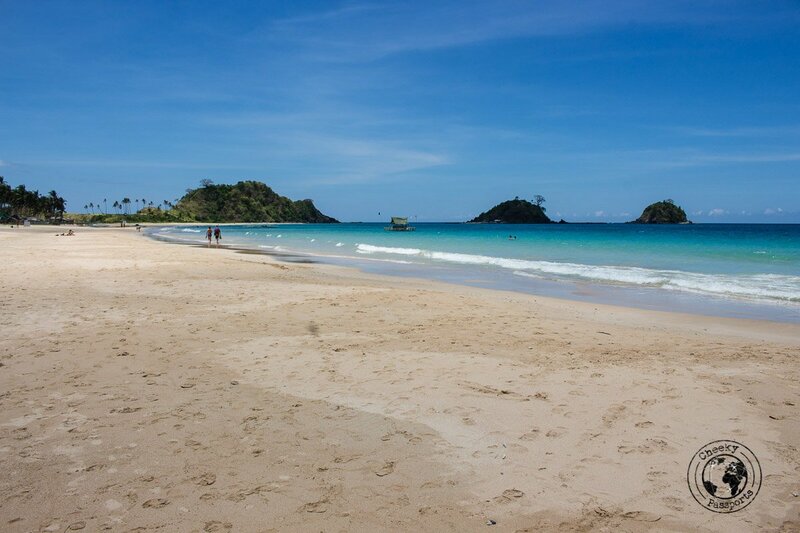 We were told that the other beach of interest, Duli beach, is about 40 minutes away from Nacpan beach, and is usually emptier but less beautiful than Nacpan beach. Our trike driver offered to take us there for an additional fee but we were too happy at Nacpan beach to bother relocating. The stop for the Nagkali-Kalit waterfalls is on the way to Nacpan beach, and again you can ask your trike driver to take you there. From the stop it’s a 40 minute hike to the waterfalls, but since we heard that the waterfalls are not too impressive, we preferred spending our time at Nacpan beach. To get to Nacpan beach you can hire a trike (the driver will wait for you and also take you back) or, if comfortable with the idea, hire your own motorbike from the town. In the latter case, do pay extra attention as the last stretch of the road is not paved and incredibly uneven. In fact we saw some other people skid and fall off their bike on our way there. Another alternative of course is to visit Nacpan beach and the waterfalls on a group tour from El Nido. 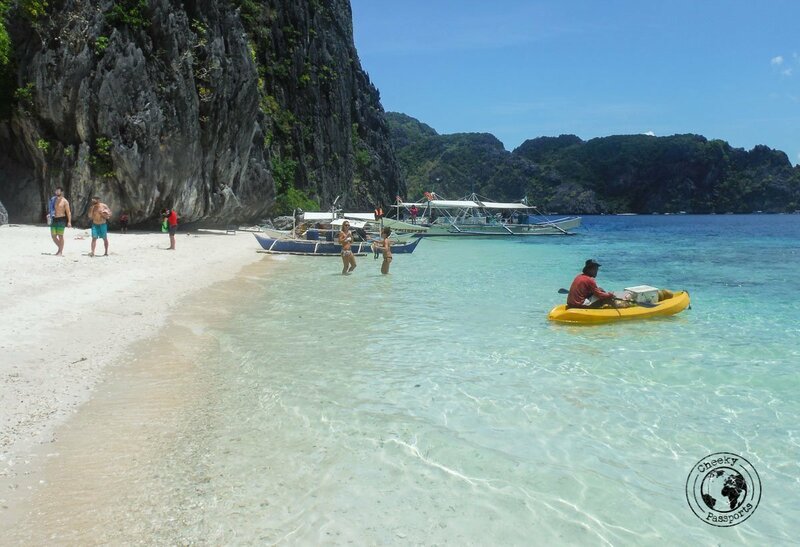 The El Nido boat tours depart from El Nido beach and are regulated, whereby all agencies offer similar itineraries. The El Nido boat tours are conveniently named Tours A, B, C and D. They can be booked from any agency or hostel in town and the price for each of the El Nido boat tours when booking in town is standardised so there’s no need to shop around. When you’re in El Nido we recommend taking at least one (if not more) of the El Nido boat tours which will take up most of your day. If you would like to to pre-book your boat tour before arriving in El Nido, check out these tours on Viator. The most popular El Nido boat tours are A and C. Since we only had time for one, we randomly chose C but were later told that C was the preferred option by people who did both, so we were happy to have made the “right” choice! 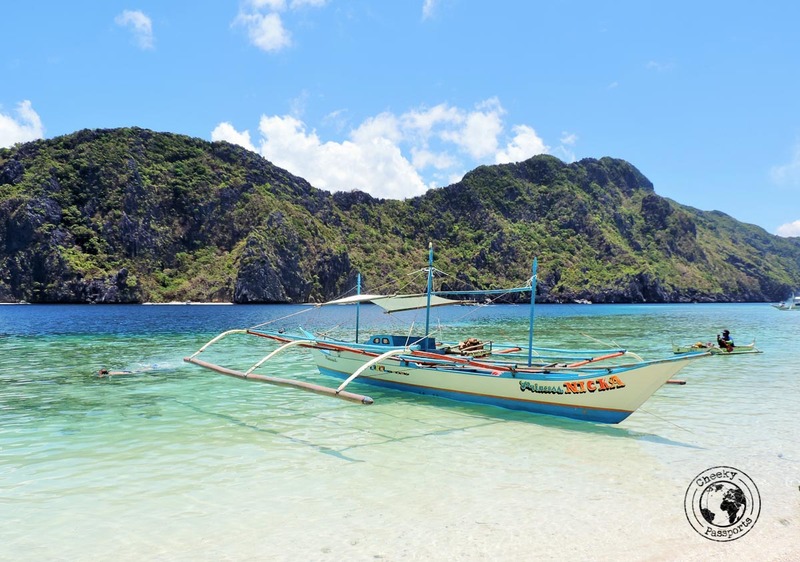 Tour C takes you to five locations all of which are beautiful, namely Helicopter island, Talisay beach, Secret beach, Matinloc island (or rather the coral reef around it) and Hidden beach. 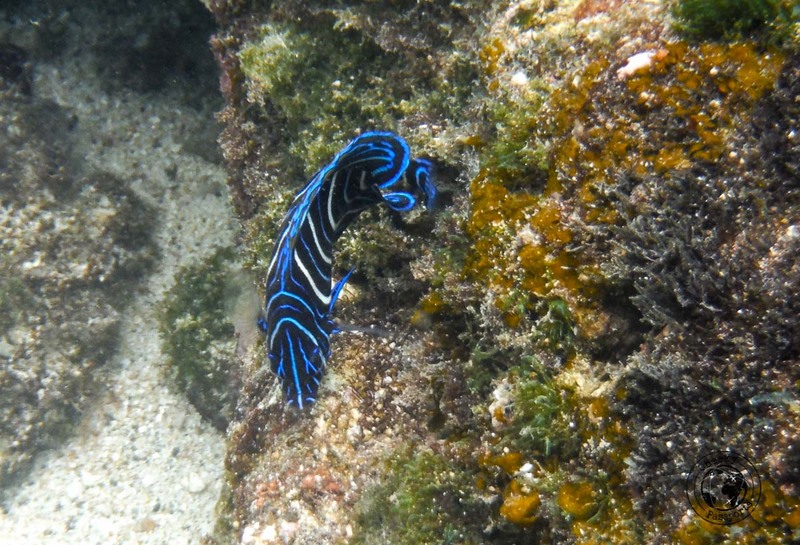 The snorkeling around Matinloc is superb and Hidden beach is absolutely gorgeous. A lunch of grilled fish, shrimp, meats, salads and fruits was served during the trip (which was actually delicious) and snorkelling masks were included in our tour price which was 1400 PHP (about €23) at the time of writing. One of the El Nido boat tours (or all!) 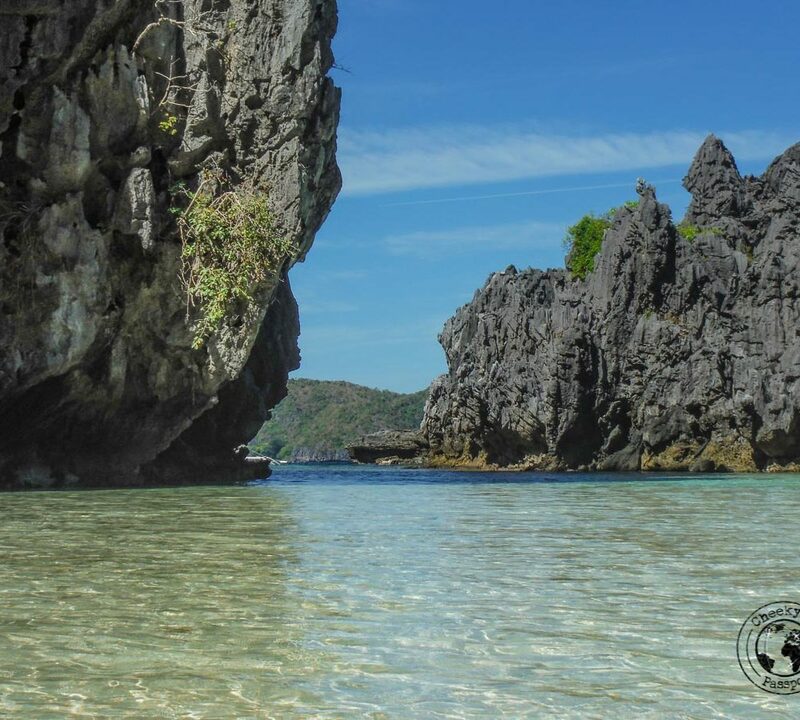 should definitely be part of your El Nido itinerary – this is where you get to experience some of the most spectacular scenery in the Philippines! Carry a torch around. Power outages are frequent and if you’re walking along the El Nido highway when it goes out, you will want the trike and bike drivers to notice you. A dry bag is a MUST during the boat trip. The boat will frequently fill up with water and if you’re seated at the front you will get soaked as well. All our clothes got really wet during the trip but they dried very quickly on one of the beaches, after which we stored them safely in the dry bag. Dry bags can be bought from any shop in El Nido and are way cheaper than those we saw at Puerto Princesa, Sabang or Port Barton. Water shoes are highly recommended for the El Nido boat trips. Parts of the beach are rocky and slippery. You might want to consider swimming with a body suit since it is likely that you will be stung and bitten by jellyfish or other fish. I was lightly stung several times, and Nikki had a little chunk of skin bitten off by a very hungry (and brave) fish whilst we were snorkelling! Avoid getting any water into your nose or mouth whilst taking a shower. We were told that the water in El Nido will make you very sick and indeed, many people claim that they got sick during their stay there. When you’re looking for budget accommodation in El Nido, we recommend staying in Corong-Corong, the town adjacent to El Nido town proper. We though that the hotels here were of better quality than the budget accommodation in El Nido proper. There is a lot less noise and less touts in this area and we feel that it offers a better experience in general. The walk from our hostel to El Nido beach was about 20 minutes long and very doable even in the afternoon heat. We will not recommend the hostel we stayed in though, because of some weird loud noises we heard at night which might have been due to the resident rat mentioned in other reviews for the same hostel. Check out the prices for budget accommodation in El Nido on Hostelworld, Booking.com or Agoda. 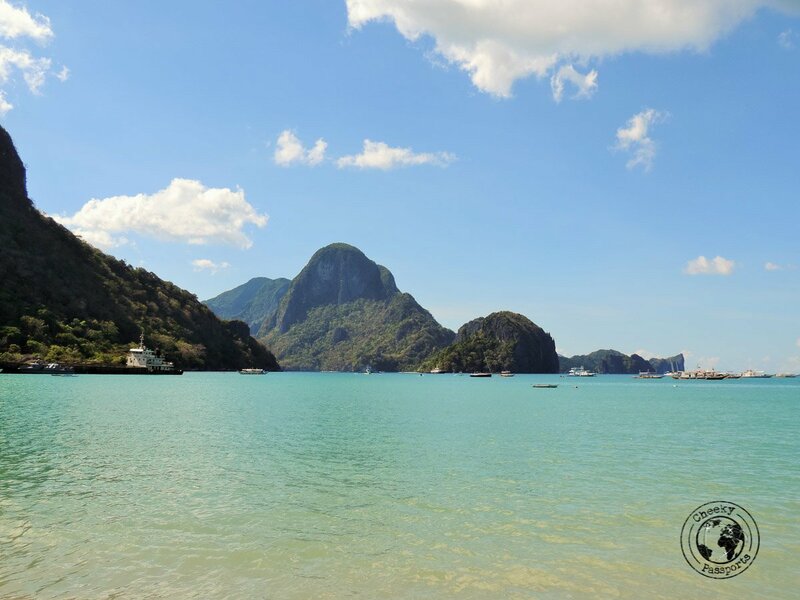 Of course, if your budget allows for some stretching, El Nido offers also a vast selection of resorts. Check out this selection of El Nido resorts. El Nido restaurants seem to be more expensive compared to those in other areas of Palawan such as Port Barton. We did find one restaurant, Sizzling Republic, which was a few minutes walk away from our hostel which served great portions of delicious local food. If you want to try a crocodile sizzler, be sure to include this place on your El Nido itinerary! The town also offers a good selection of bakeries and markets. Since we were carrying both Smart and Globe SIM cards, we rarely had problems accessing data on our phones. Internet access in El Nido seems to have improved a lot in the past few years although WiFi in most hotels leaves a lot to be desired! The data signal becomes very weak as you move away from the town. 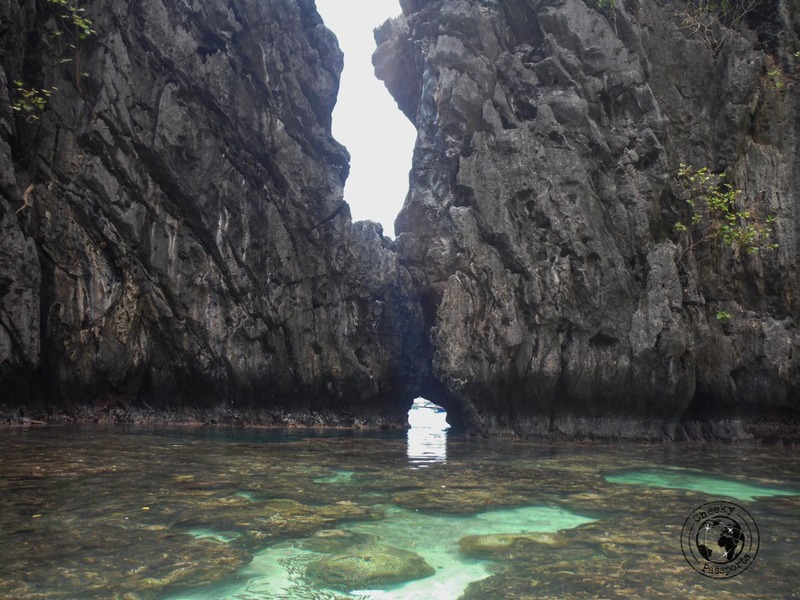 We hope that this three-day El Nido itinerary helps you in planning out your trip to Palawan!